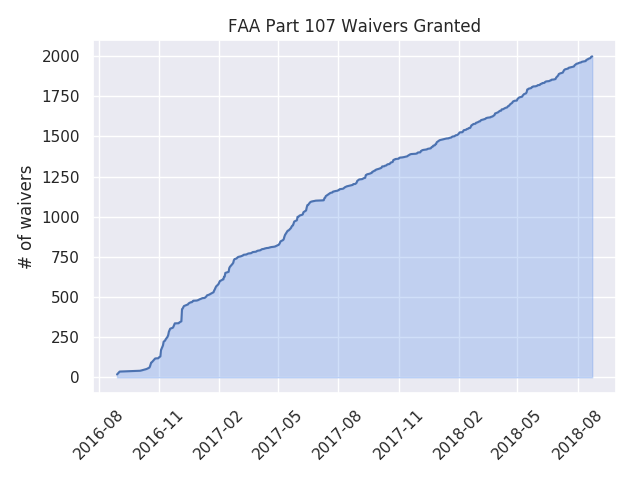 As of August 28 2018, there are at least 61,613 pilots with a part 107 UAS (drone) certificate. I say at least because the FAA allows pilots to exclude themselves from the public database, in which case they do not show up in the data set. Per this press release, the FAA hit 100,000 certificates about a month ago, so a first order estimate puts the number of pilots who don't exclude themselves around 60%. The FAA publishes new data every month, so in a couple days there will be more available. This is the first month I have obtained data, so I don't have anything to compare to yet. As of today, there have been 1,999 waivers granted to 1,854 individuals at 1,544 companies.